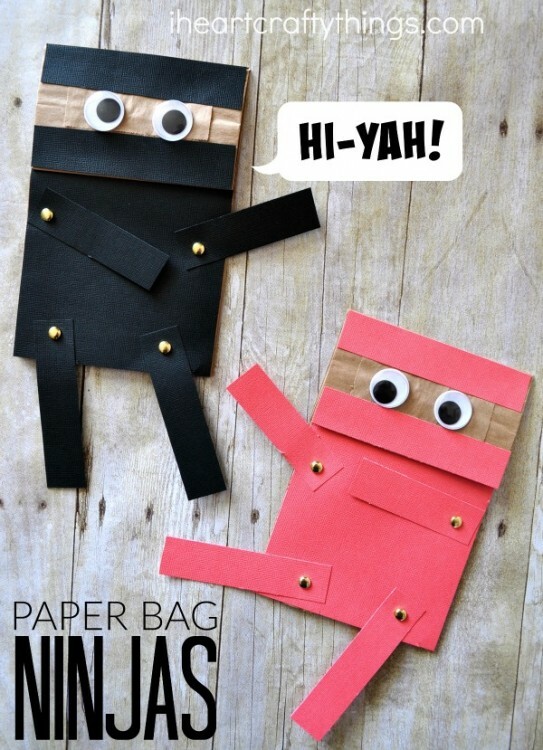 Paper Bag Ninja Craft for Kids ...Hi-Yah! 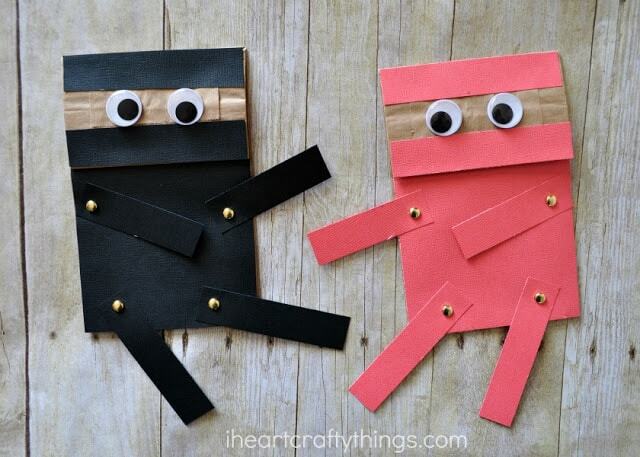 Do your kids love ninjas? Mine sure do! They especially love to dress up and pretend to be ninjas. I taught them a simple trick of how to turn a long-sleeved black shirt into a ninja mask and ever since then it’s been a favorite afternoon dress up activity that includes lots of pretend kicks and “hi-yah’s”. 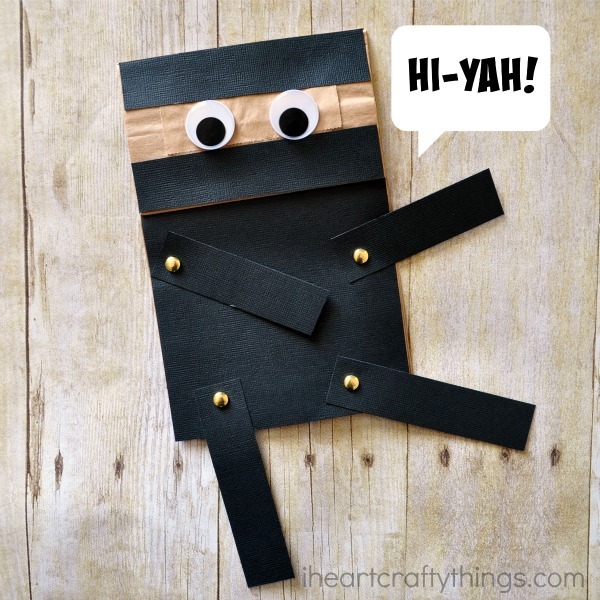 If your kids love ninjas as much as mine do, they will love this simple paper bag ninja craft. 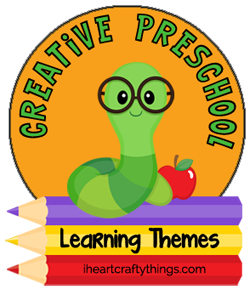 It’s a craft and a puppet all in one and the repositionable arms and legs make it a fun and interactive activity for preschoolers. Make sure to check out more awesome ninja activities at the bottom of this post! 1. Start by cutting 3-inches off of the bottom of your paper bag. 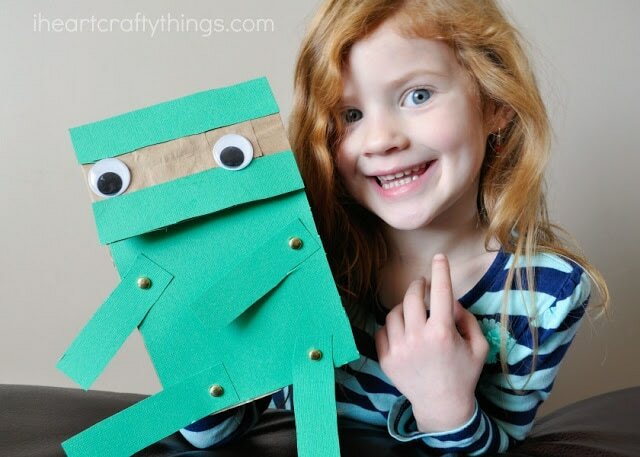 This gives your paper bag ninja craft the perfect body height. 2. 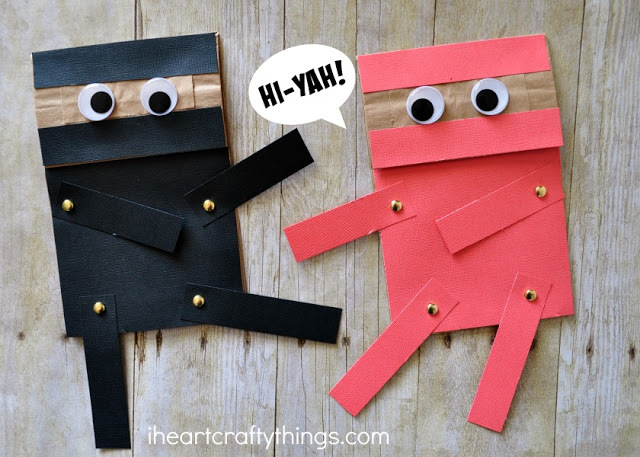 Cut out the pieces from your colored cardstock paper that you need to cover your ninja. (see the picture below.) You’ll need a rectangle piece to cover the body (about 5 inches by 6 inches), two strips to cover the face (about 5 inches by 1 inch) and two long strips that are 1-inch in width for you to cut out arms and legs for your ninja. If you have a paper cutter you can easily cut those pieces out in advance for your preschooler. 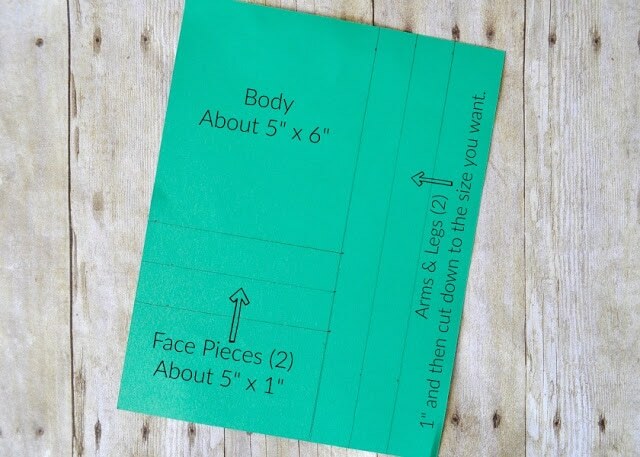 Or, if you want to give your preschooler extra scissor cutting practice you can use a ruler and pencil to draw out the pieces for your preschooler to cut out. You can see how I drew out the pieces for my preschooler below. 3. After you preschooler has cut out all of the pieces, glue the body and face pieces onto your puppet. Leave a gap in the middle of your face for the eyes. 4. To attach the arms, position one of the arms where you want it on your puppet and use a hole punch to punch a hole into your bag for the metal paper fastener. 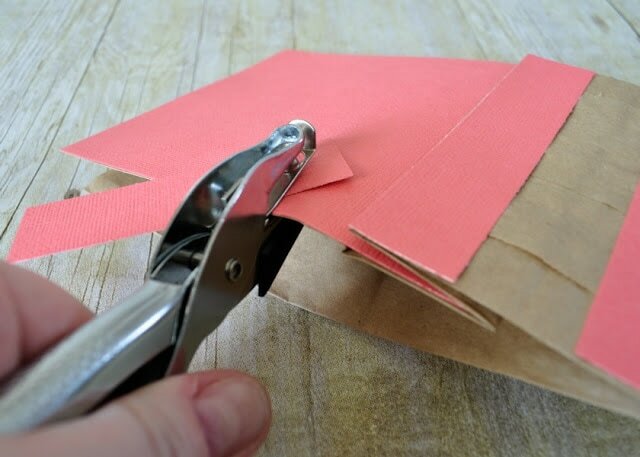 You end up with an extra hole on the side of your paper bag, but you want to make sure that when you thread the metal paper fastener through, you only use the hole that you punched in the front of the bag. Do the same on the other side of the bag to attach your other arm. 5. To attach the legs, position them where you want them at the bottom of the paper bag and use your hole punch to punch a hole into the leg and the front of your paper bag. Attach the legs with your metal paper fasteners. 6. 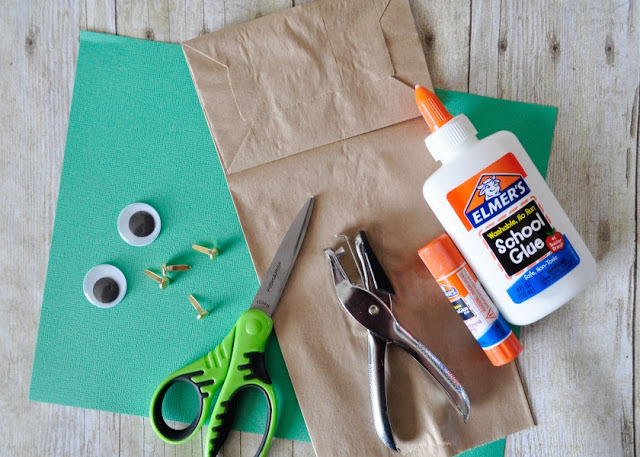 Use your school glue to glue on your googly eyes. Let the glue dry for a bit before playing with your craft. 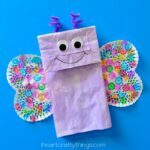 Now your paper bag ninja craft is all ready for play! 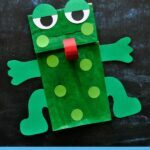 Check out these 20 creative ways to turn a paper bag into animal puppets! Argh! 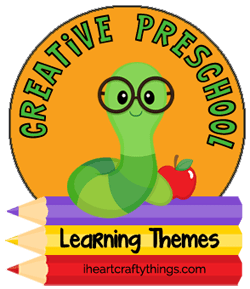 Do your kids love pirates? Here’s a clever way to make some pirate finger puppets for putting on a puppet show. Have you ever tried smash painting? This colorful technique is so much fun for kids. 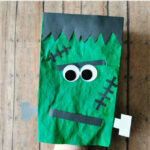 After creating their smashed blobs, kids will love turning them into monster puppets. Love that this is so interactive with the moveable hands and feet! Looks so fun! I love how your ninja craft moves and your daughter looks adorable holding it! What a great idea for an interactive ninja!